On July 14, New Horizons flew past Pluto. This milestone marked a nine and a half year journey that began in 2006. When NASA launched New Horizons in January of 2006, Pluto was still the 9th planet of our solar system. Seven months later, in controversial circumstances, less than 5% of the world’s astronomers voted at the 2006 Prague meeting of the IAU to demote Pluto to dwarf planet status, reducing our Solar System to 8 planets. This however has not dampened the excitement and anticipation of New Horizons’ rendezvous with Pluto on 14 July 2015. The world now awaits the latest fly-by images from New Horizon. 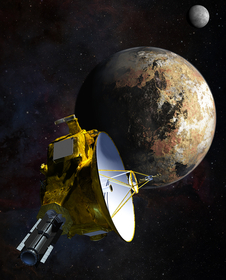 Check this page regularly for updates and important information on the New Horizons mission. More information can also be found on NASA's official New Horizons web page. On Sept. 5, seven weeks after its close fly-by of Pluto, New Horizons began what will be an intensive year-long uplink of tens of GB of data collected and stored on the spacecraft. The first lot of images downloaded over the past 2 weeks have revealed a wealth of new surface features including possible dunes, networks of valleys, nitorgen ice flows that may have originate from mountainous regions and jumbled mountainous lanscapes similar to those seen on Europa. The image seen below was taken on July 14 when New Horizons was 80,000km from Pluto, and is an example of some of the complex terrain seen. The smallest resolvable features are 0.8km wide. The iamge is a 350km wide view of Pluto showing a diversity of surface reflectivities and a large variety of landscapes. Visible is the older heavily cratered dark terrain, next to younger smooth bright terrain, masses of mountains and a field of dark aligned ridges that look like sand dunes the existence which are under fierce debate. The possible presence of sand dunes on Pluto raises some interesting dilemmas. Pluto has a thin atmosphere today so either there was a thicker atmosphere in the past to allow for winds, or some other unkown processes are at play. Click on the image for a larger view. Other recently downloaded images include a higher resolution image of Charon taken 10 hours before the closest fly-by point, showing complex geological features such as cental heavily cratered regions contrasted against fractured plains to the lower right of the disk, mountainous regions surrounded by sunken terrain to the right side, and an obvious dark north polar region. Click on the image for a larger view. One of the most stunning images is that taken by New Horizons' wide-angle Ralph/Multispectral Visual Imaging Camera (MVIC) during the fly-by and downloaded on Sept 13. It is a view of Pluto's crescent with an oblique look across landscapes being backlit by the sun. In a scene reminiscent of Earth's arctic region, it shows Pluto's varied terrain against its atmospheric complexity. The image is 1,250km across. Click for a larger view. For more stunning images go to NASA's New Horizons website. As New Horizons is now 5 billion kms for Earth and 70 million km beyond Pluto on its way to its next target in the Kuiper Belt - 2014 MU69, scientists await many more surprises from the large downlink that will continue over the next year. Seven hours after New Horizons flew past Pluto, it aimed its LORRI camera back at Pluto to capture background sunlight from the Sun streaming through the dwarf planet's thin atmosphere. What it revealed was surprising even to scientists - hazes up to 130 km high above Pluto's surface. In fact the preliminary analysis has found two distinct layers of haze, one at an altitude of 80km and another at an altitude of 50km. It is believed that hazes form when UV light breaks up the methane gas particles in Pluto's atmosphere which then triggers the buildup of more complex hydrocarbons such as ethylene and acetylene. As they fall to lower and colder parts of the atmosphere these complex hyfrocarbons condense into ice particles to create hazes. 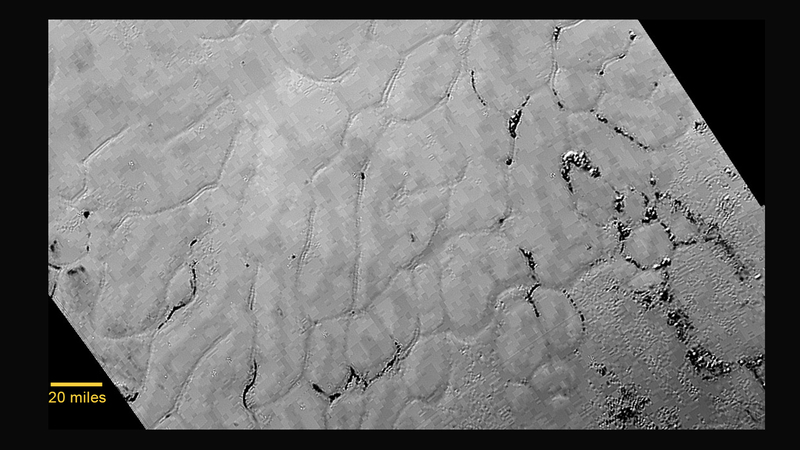 The UV sunlight the convets these hazes into thiolons, which are dark hydrocarbons that colour Pluto's surface. This is an unexpected result as previous calculations suggested that temperatures were not cold enough above 30km for hazes to form. 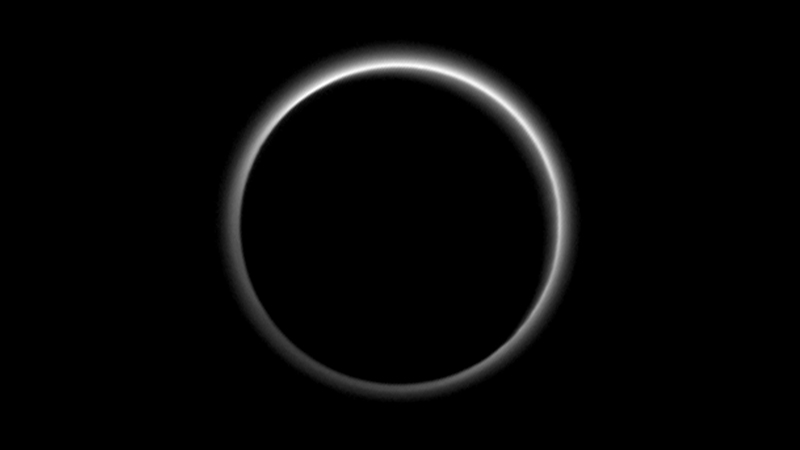 The spectacular image of Pluto backlit by the Sun is shown below. 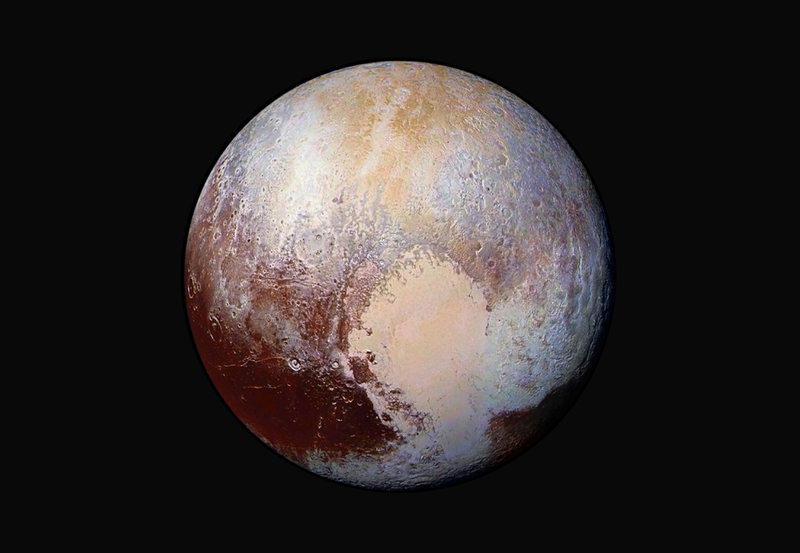 New Horizons' LORRI camera also found exotic ices flowing across Pluto's -235 degC surface, particularly in Sputnik Planum which lies on the western half of Pluto's heart-shaped feature known as the Tombaugh Regio. There is clear evidence of a sheet of ice that appears to have flowed, and could still be flowing as glaciers do on Earth. Data from the Ralph instrument indicates that these ices are rich in nitrogen, carbon monoxide and methane. There is even evidence of older cratered terrain which has been invaded by newer icy deposits. As more information is beamed back to Earth from New Horizons, there are surely more surprises in store. The New Horizons team have combined close-up images of Pluto with colour information from the Ralph instrument to create an enhanced colour portrait of the dwarf planet. This helps scientists detect differences in the composition and texture of pluto's surface. The Sputnik Planum ("heart of the heart") is likely a source region of ices with the two bluish-white lobes southwest and northeast of the heart likely representing exotic ices which are being transported away from Sputnik Planum. The image below was created from 4 images from the LORRI camera during the fly-by with colour info from the Ralph instrument. New Horizons was only 450,000 km away when these were taken, with features as small 2.2 km visible. Click on the image for a larger view. The same image in true colour is also shown below. (i) Pluto's atmosphere - New Horizons has observed Pluto's Nitrogen-rich atmosphere up to 1,600 km above its surface (previous measurements were only up to 270 km). This new information was measured by the Alice imaging spectrograph about an hour after the fly-by. At this time New Horizons, Pluto and the Sun were in alignment, known as a Solar occultation during which the spacecraft pased through Pluto's shadow, while being backlit by the Sun. This is not the end of this story however as the full Alice Occultation data set will be fully downloaded next month. For more information, click on the image below. 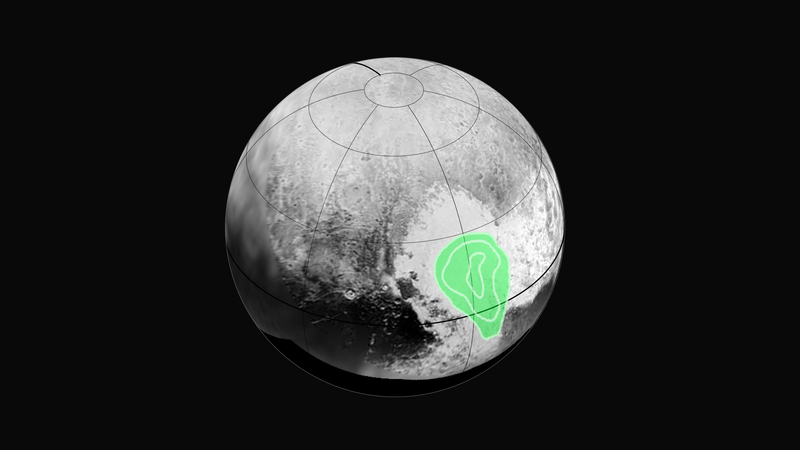 (ii) Frozen Carbon Monoxide Detected in Pluto's 'Heart' - The western half of the heart-shaped plain (known informally as Tombaugh Regio), contains evidence of frozen carbon monoxide, according to measurements made by the onboard Ralph instrument. The contours on the image below show that the concentration of the CO increases towards the centre of the bull's eye. (iii) Frozen Plains in the Heart of Pluto - A new close-up image of Pluto's heart-shaped region reveals a vast craterless plain that is likely less than 100 million years old and is possibly still being re-shaped by geological processes. 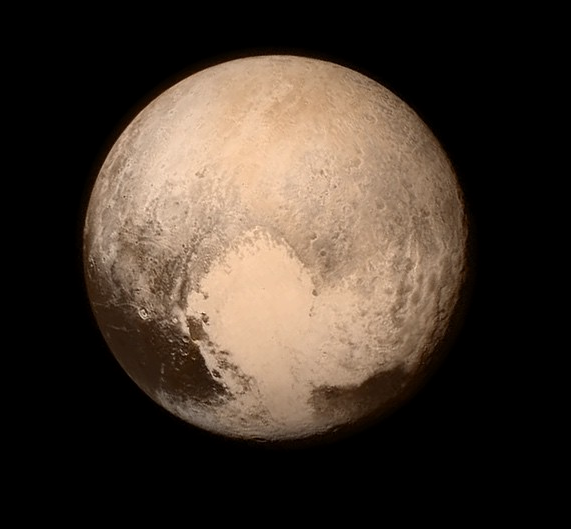 The close-up is in the centre left of the heart-shaped feauture informally named the Tombaugh Regio. This unexpected finding is one of the most difficult to explain so far. These icy plains resemble frozen mud plains on Earth and has been informally named "Sputnik Planum" after Earth's first artificial satellite. The irregular shapes are approximately 20 km across bordered by what appear to be shallow troughs, some of which have darker material in them. There are also small pits in some places which could be evidence of sublimation where ice turns directly from a solid to a gas as dry ice does on Earth. Scientists are working on 2 theories to explain the shapes: one is that the irregular shapes are due to the contraction of surface materials (like mud drying); or it could be a product of convection similar to lava rising in a lamp except that on Pluto, it would occur within a surface of frozen carbon monoxide, methane and nitrogen, with the convection driven by the warmth of Pluto's interior. For more information click on the image below. 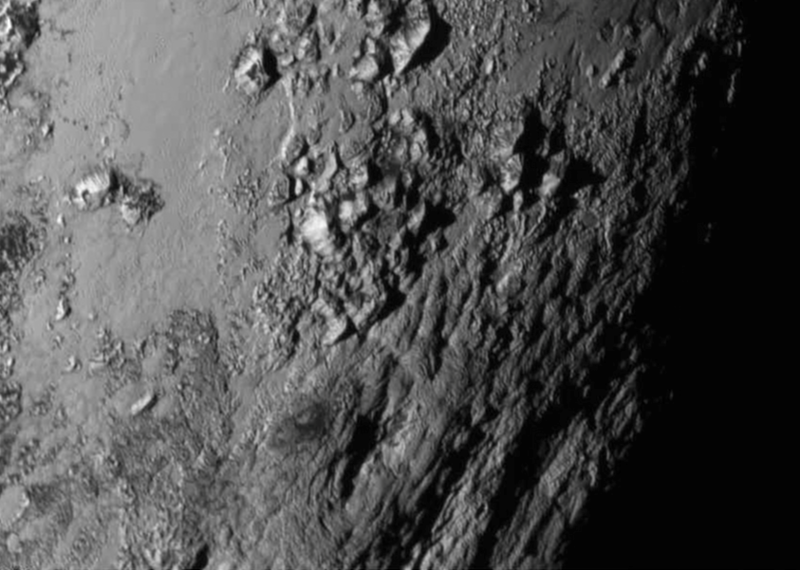 Just one day after the Pluto fly-by, the New Horizons team have announced several new discoveries including mountains with peaks on Pluto, as well as cliffs, troughs and a canyon on Charon. A close up image of the equatorial region of Pluto near the bright heart-shaped feature (see below) reveals a mountain range with peaks reaching as high as 3.5km above Pluto's icy body. It is believed these are relatively young formations, as young as only 100 million years, suggesting that Pluto may still be geologically active. This raises questions as to what mechanisms may be causing this as tidal interactions are ruled out. 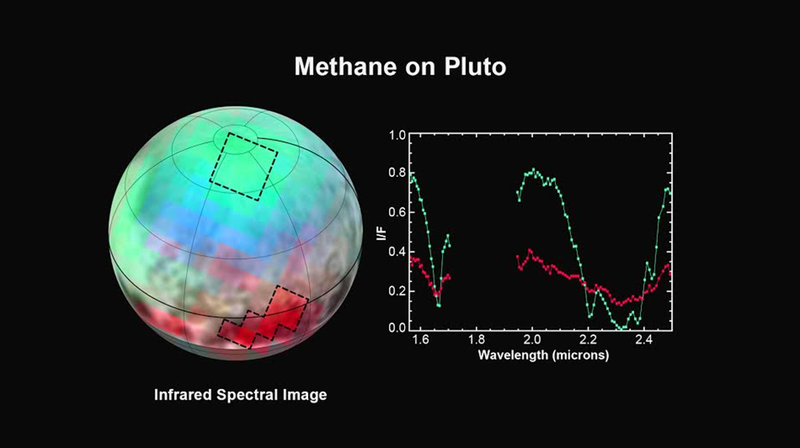 Spectroscopic data also reveals an abundance of methane ice on Pluto. This data is produced by the Linear Etalon Spectral Imaging Array which is part of the Ralph Instrument on New Horizons which makes its measurements at 3 dfferent infrared wavelengths. In the image below blue corresponds to wavelengths between 1.62 and 1.7 micorns representing a medium to high absorption band of methane ice, green corresponds to wavelengths between 1.97 to 2.05 microns where methane ice does not absorb light, and red corresponds to wavelengths between 2.3 and 2.33 microns which represents very high absorptions of methane ice. This data was obtained before the fly-by on July 12. New views of Charon also reveal a young and varied terrain with a lack of craters. These features include cliffs and troughs stretching 1,000 km acrross suggesting geological processes. A 7 - 9 km deep canyon is also apparent. The obvious lack of craters is also a surprise to scientists indicating a relatively young surface that has been reshaped by geological activity. 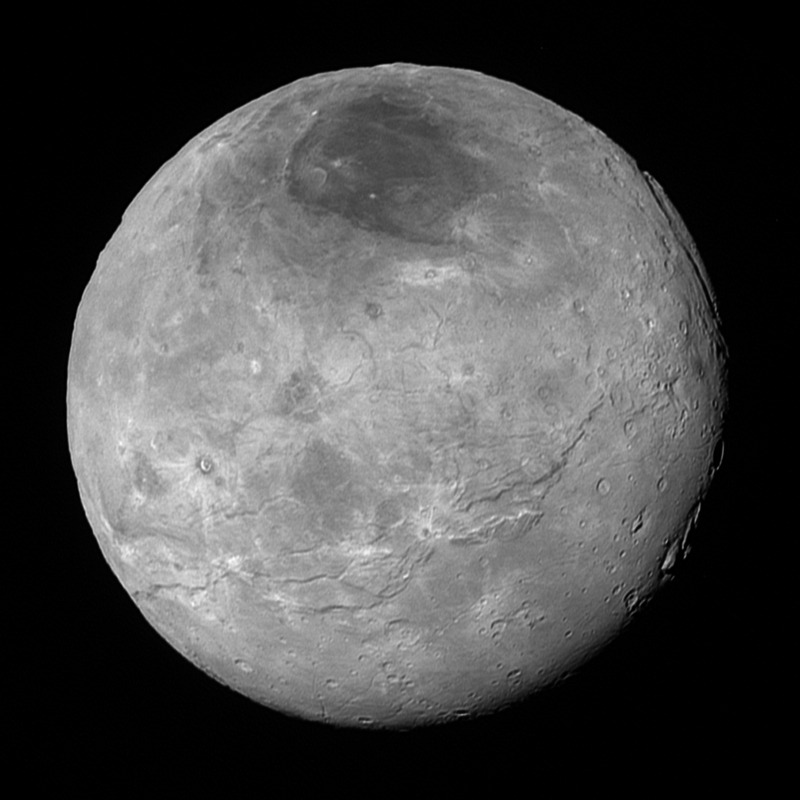 An image of Charon taken on 13 July is shown below. Click on the image for more info. Keep a regular eye on this site as well as the NASA New Horizons site for regular updates as more information and images are released. When New Horizons was completing its fly-by of Pluto yesterday, it had already been instructed to maintain radio silence and spend the day gathering as much data as possible and not to communicate with Earth until it was beyond Pluto. This meant that there was a nervous 21 hour wait for the mission team before it received a pre-programmed 15 minute telephone call at 9pm on Tues 14 July (US EDT) which consisted of a series of status messages from the spacecraft. According to Alan Stern, the next dump of data from New Horizons is expected to begin at 5:50 am 15 July US EDT, with a report on findings later in the day at around 3:00pm US EDT (5am, 16 July Melb time). This should incude images at 10x the resolution of the last pre fly-by image, as well as spectroscopic and clour data on Pluto, Charon and the other satellites. Check back here tomorrow morning for some new fly-by images. A quick celebration by the New Horizons team at NASA hailed New Horizon's scheduled fly-by on July 14. New Horizons had its transmitter turned off and was busy doing its science during the fly-by, and will start beaming back some information later in the day. While the full fly-by data will take 16 months to download completely, the first images should be available at 9pm EDT US time (11am Melb time, 15 July). In the meantime, to whet your appetite, here is the last pre fly-by image of Pluto which was taken by New Horizons about 16 hours before closest approach (July 13) at a distance of 766,000 km from Pluto. Each pixel is 4km and the image is 1000 times better than what any telescope on earth can produce. It was initially posted on Instagram. The improved resolution and bright heart-shaped feature can be clearly seen. As tweeted by Alan Stern, the New Horizons Mission Principal Investigator, images taken at closest approach will actually be 10X better than this one! Check back again 11am Melb time July 15 to see what surprises New Horizons has for us. As New Horizons approaches its last million miles to Pluto, a new image taken on July 11 has revealed more features which are of interest to the Geology, Geophysics and Imaging (GGI) team at the John Hopkins University Applied Physics Lab in Maryland. As shown on the image below, new features that may be cliffs and a crater are revealed. A bright heart shaped feature is also beginning to rotate into view. After a nine-year journey from Earth, New Horizons is now fast approaching Pluto for its fly-by at 9:49 pm on Tuesday July 14 (AEST time). Make sure you stay in touch with the latest news from NASA on both this website as well as NASA's New Horizons website. You can also download and launch NASA's Eyes app for a real-time visualisation of New Horizon's journey, or follow the official New Horizons Twitter feed ( #PlutoFlyby ) or Facebook page. With ever improving images beamed back as we approach the fly-by close encounter in 3 days, the latest images of Pluto taken by the LORRI camera on board New Horizons show it has distinct geological features. 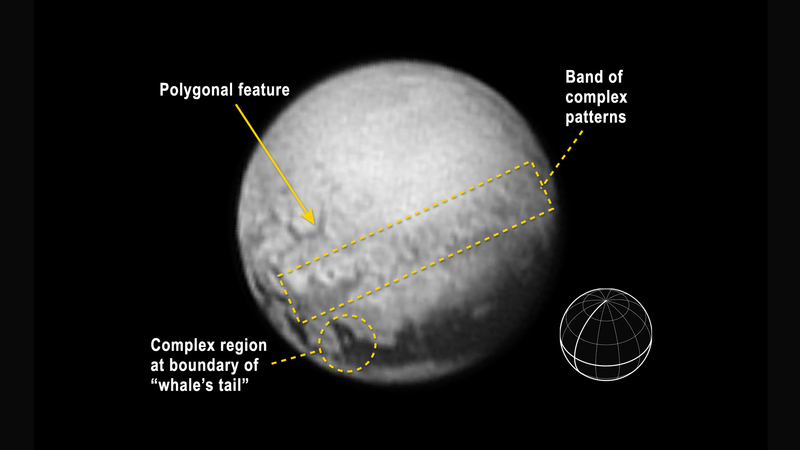 Looking at the image above, some of the fearures which are of particular interest include polygonal features, complex terrain stretching 1,000 miles east to north-east across the planet, and a complex region where bright terrains meet a dark terrain - the so-called tail of the dark whale-shaped feature which sits on Pluto's equator. 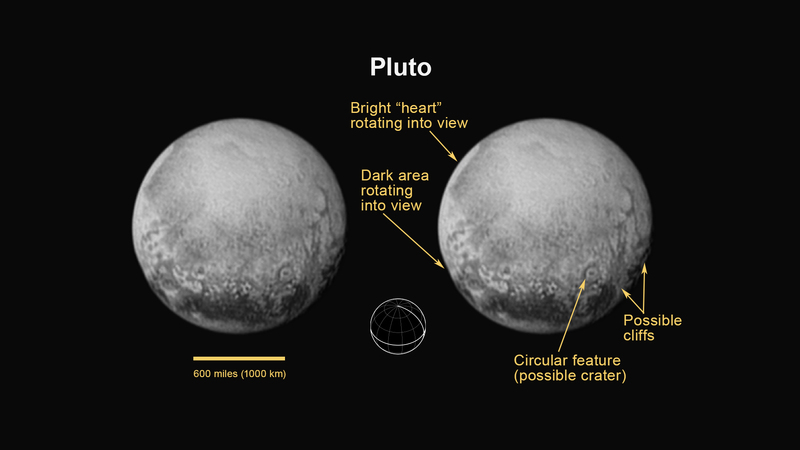 This feature is on the side of Pluto that always faces Charon. Make sure you keep checking daily for more exciting updates as we fast approach the fly-by day. Of course, given the low bandwidth connection that is set up with New Horizons, many more images will be streaming back and processed well after the fly-by date. As NASA officially began New Horizons' fly-by sequence on 8 July, a recent snapshot of Pluto and Charon by the LORRI camera combined with colour information from the Ralph instrument, shows that they are more like strangers than siblings. Pluto's surface shows a high contrast array of bright and dark features, while Charon exhibits a predominatly dark grey terrain which is only interrupted by a dark polar region. 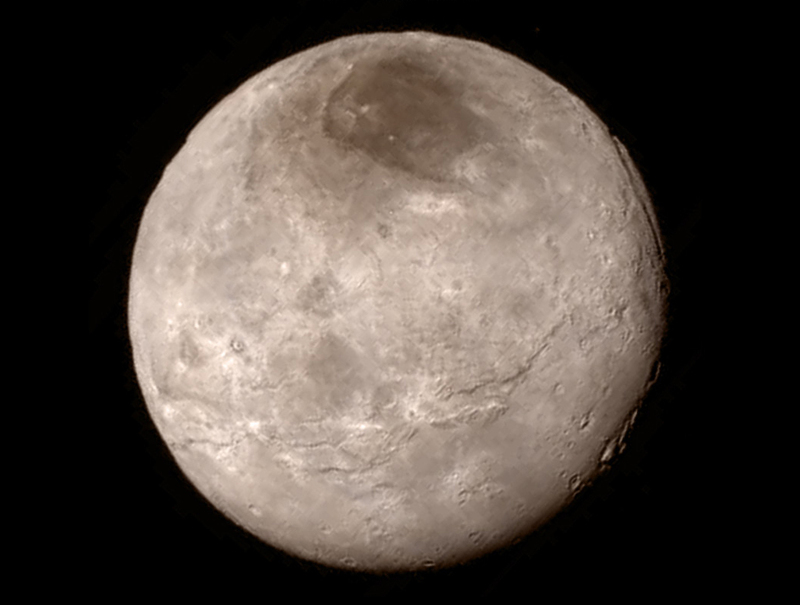 Charon also lacks the reddish hue and significant atmosphere that Pluto has. Pluto has frozen methane, nitrogen and carbon monoxide, whereas Charon's surface is made of frozen water and ammonia compounds. Scientists also believe that Pluto's interior is mainly composed of rock, whereas Charon's is likely made up of equal amounts of water ice and rock. Both objects were likely shaped by a cosmic collision billions of years ago but each are essentially their own worlds. With 4 days to go to the closest approach, the mission so far has thrown up plenty of unexpected surprises and all eyes are now cast on Pluto as more spectacular photos and results of experiments are expected to thrill further as the secrets of the Pluto and its satellites are slowly revealed. Click on the image below to see more information on the latest data. With 10 days to the Pluto fly-by, mission operations temporarily lost contact with New Horizons for 1hr 21 mins on July 4. Communications was re-established using the NASA Deep Space Network. During this time New Horizons detected a problem, went into autopilot and switched to its back up computer. The health of the spacecraft has since been confirmed with no software or hardware fault detected. The problem was a hard to detect timing flaw in the spacecraft command sequence. New Horizons plans to return to normal science operations on July 7 with no disruption to the fly-by sequence. As we count down the days to New Horizons' Pluto fly-by, new colour images show that Pluto has 2 distinct faces. One of these shows a series of equally spaced dark spots (each 300 miles wide) along the equator which has scientists intrigued. To produce these images, black and white images from the LORRI camera were combined with lower resolution colour data from the Ralph instrument to produce an approximately true colour image. Another intriguing observation is the striking difference between the colour of Pluto with respect to its greyer moon Charon. As the excitement builds with only 12 days left, the New Horizons team are also preparing to search for clouds on Pluto, and also measure the Sun's light as it passes through Pluto's escaping atmosphere in the short July 14 fly-by window. Click on the image for a larger view. 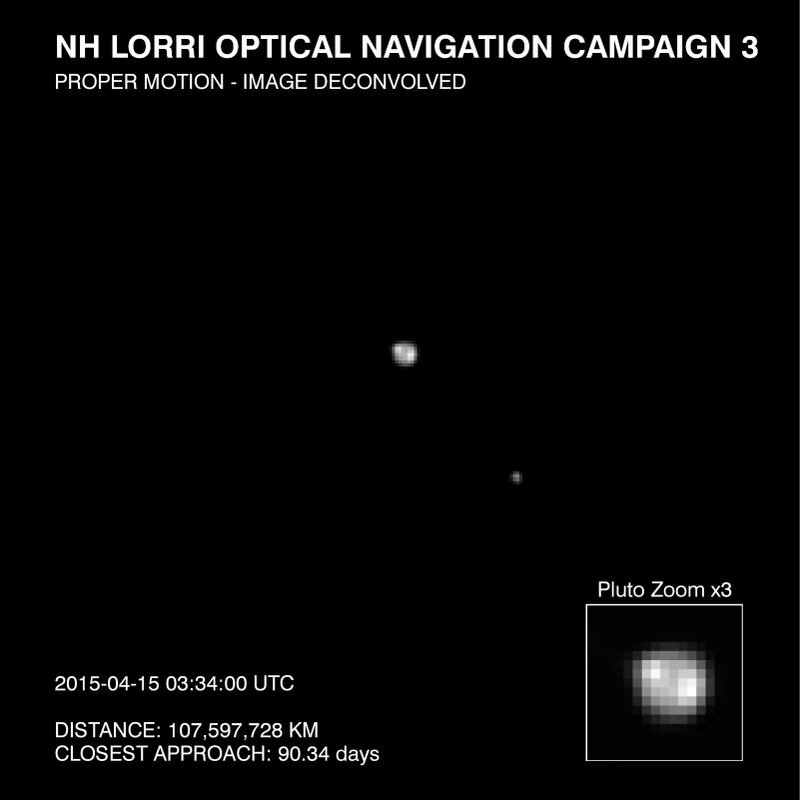 With only 3 weeks to go to New Horizons' fly-by of Pluto, a long series of images taken by the onboard LORRI camera between May 29 - June 19, reveals that the close approach hemisphere that the spacecraft will fly over has the largest variation in terrains seen so far. 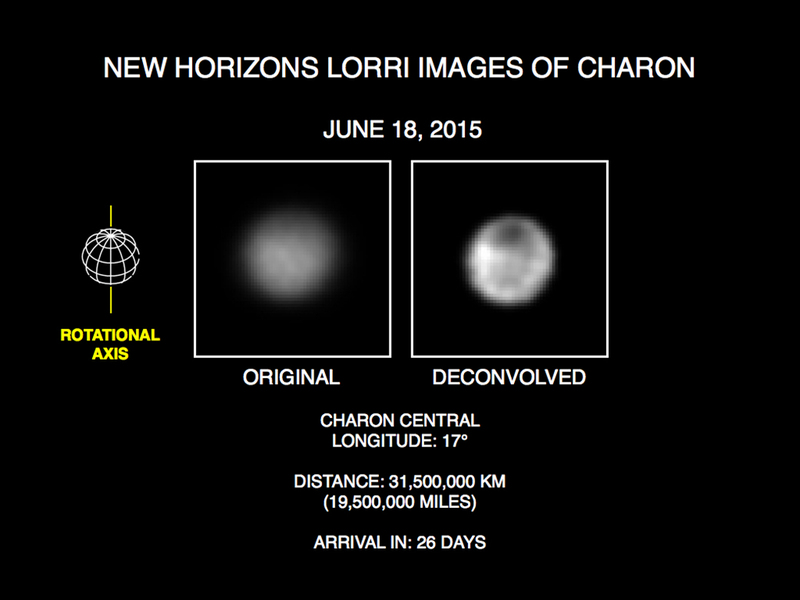 Additionally, the New Horizons team has discovered that Charon has a dark pole - a totally unexpected feature. While a deconvolution image processing technique is used to sharpen the raw pixelated images, the team are continually reviewing newer images as they come in to determine whether some of the features seen are artefacts of the processing. The detection of bright and dark features however is unambiguous and reinforces that complex terrains exist on both Pluto and Charon. New Horizons is currently about 4.7 billion kms from Earth, with only 25 million kms to go untill the fly-by on July 14. As New Horizons continues to get closer to Pluto, recent images taken by the on board LORRI camera are starting to reveal more features on the dwarf planet's surface. 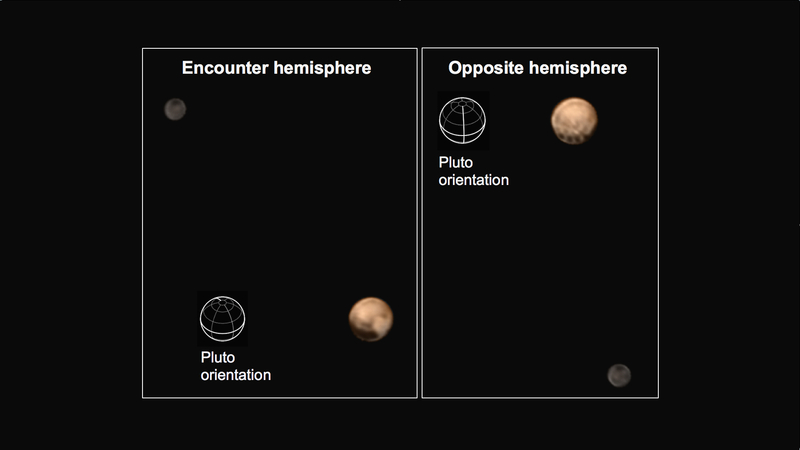 Comparing images taken between April 16 and May 12 (just under 4 weeks apart), during which time the spacecraft has travelled 20 million miles, Pluto's scale grew to twice as many pixels showing broad bright and dark surface markings including a bright area which is likely to be a polar cap. 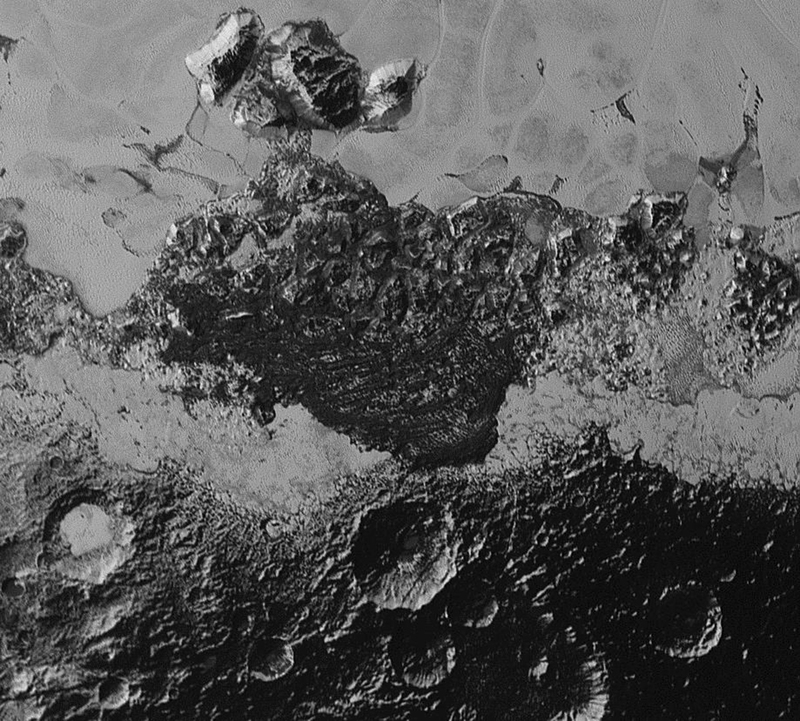 Even these fuzzy images suggest Pluto has a complex surface geology. 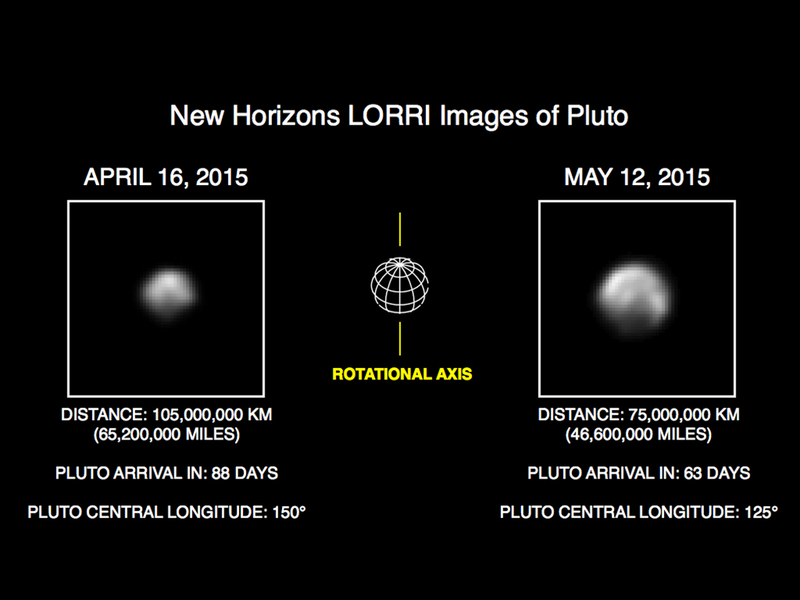 The image below shows a comparison of the images taken by the LORRI camera between April 16 and May 12, 2015. An image deconvolution process was used to sharpen the raw images. For more information, click on the image. More recent processed images taken between May 29 - June 2 (shown below), reveal some more distinctive features showing discrete equatorial bright and dark regions. The odd shape of Pluto in these images is not real and is due to the image processing as well as the large variation in surface brightness. As we count down the days towards its closest approach on July 14, these still blurry pictures set the scene for an exciting few weeks to come. In yet another first, New Horizons has taken photographs of Pluto's faintest and least known moons, Styx and Kerberos, which were discovered by the New Horizons team using the Hubble Space telescope in 2012 and 2011 respectively. Pluto has 5 known moons with Styx orbiting Pluto every 20 days between the orbits of Charon and Nix, and Kerberos orbiting the dwarf planet every 32 days between the orbits of Nix and Hydra. The images shown below were taken by the sensitive LORRI camera on board New Horizons from a distance of 55 million kms between April 25 and May 1. The image on the left consists of five 10-second exposures added together. These are then heavily processed to reduce the glare of Pluto, Charon and background stars to reveal the faint moons. Click on the image for a larger view. New Horizons will now search for new moons or rings that may threaten its passage through Pluto's system in July. For the first time, pictures taken by New Horizons' LORRI camera show dark and bright regions on Pluto's surface, including a bright area at one of its poles that may be a polar cap. The images were taken over a 6-day period from the 12 - 18 April, over which time the spacecraft travelled about 7 million kms. A deconvolution technique was used to improve the resolution of the LORRI images. This early image already suggests that Pluto has a complex surface and is a very early taste of the images that New Horizons will be able to send back to Earth as it gets ever closer to its fly-by on July 14. Click on the image to the right to see a larger view. 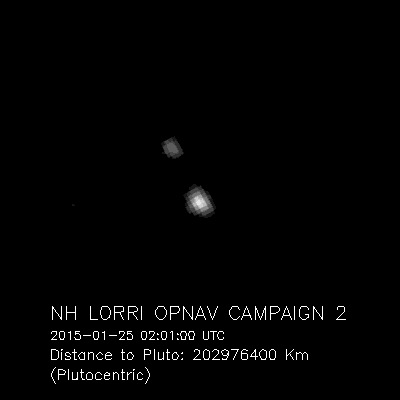 An updated view of the Pluto-Charon system in motion can also be seen here. New Horizons has taken its first colour image of the Pluto-Charon system, the first ever colour photo of Pluto by any spacecraft on approach. It was taken on April 9 by the on board Ralph colour imager from a distance of 115 million kilometres, approximately the distance between the Sun and Venus. While this distance is still too far to resolve any features, the distinct difference between Pluto and Charon's appearances can be clearly seen. NASA's spacecraft has now been travelling towards Pluto for more than 9 years over a distance of 4.8 billion kms - longer and further than any mission in history on its way to its primary target. 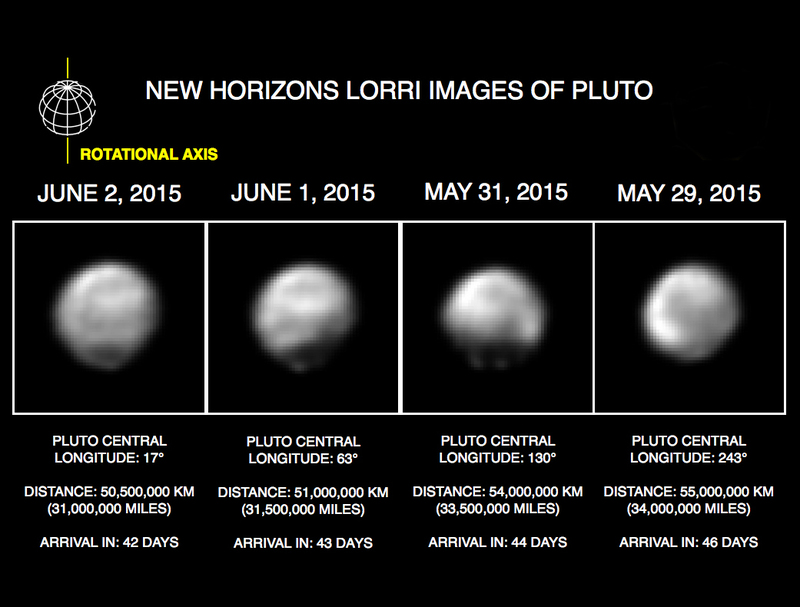 March 10 2015 - New Horizons Homes In On Pluto with 1 AU To Go! After a 93 second engine burn to adjust New Horizons' trajectory to Pluto on March 10, the spacecraft passed another major milestone entering the last AU (Astronomical Unit) on its way to the dwarf planet. The commands which took around 4.5 hours to reach the spacecarft, were transmitted to New Horizons using the NASA Deep Space Network Canberra Station in Australia. 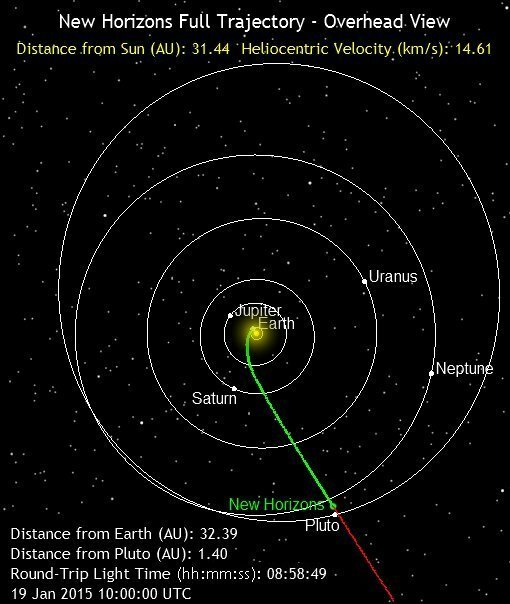 The correction slowed New Horizons to 1.14m/s which will delay its arrival at Pluto on July 14 by 14 mins and 30 s.
This latest trajectory burn means that New Horizons now holds the record for the longest distance trajectory correction burn at 4.77 billion kms from Earth. This was previously held by Voyager 2 whose last engine burn occured when it was 4.5 billion kms from Earth back in 1989. Exactly 85 years after Pluto was discovered by Clyde Tombaugh, New Horizons provided its first images of Pluto's two small icy moons , Nix and Hydra. Both small icy moons are visible on a series of images taken by the spacecraft between Jan. 27 - Feb. 8. The images are assembled into a seven frame movie showing the moons in the full glare of Pluto on the left sequence, and a processed sequence on the right which has removed most of the glare and the background stars. Hydra, the outermost moon which orbits Pluto every 38 days, is identified by the yellow diamond, while Nix, which orbits Pluto every 25 days, is identified by the orange diamond. The dark and bright streak in the images is due to an artefact of the camera electronics caused by the overexposure required to capture both Pluto and its satellites. Click on the image for a larger view. New Horizons returned new images of Pluto on the 109th brthday of Clyde Tombaugh. Taken by the spacecraft's Long-Range Reconnaissance Imager (LORRI), New Horizons was more than 126 million kms away when it started taking these images on 25th and 27th of January. Until around May, Pluto and its moon Charon will only resemble small dots in images, but the spacececraft will continue to take hundreds of photos over the next few months to help refine its course to the dwarf planet. The still image is a 0.1 sec exposure magnified by 4 times from the original, and shows both Pluto (2 pixels wide) and Charon (1 pixel wide). Click here to see more information about the images. The time lapse video shows an entire rotation of Pluto and Charon over a single Plutonion day (6.4 Earth days). The images that make up this time lapse took about a week (Jan 25 - 31, 2015) to capture. Note the motion of Pluto due to the gravitaitonal effects of Charon. Because of the relatively large mass of Charon when compared with Pluto, both objects orbit around a barycenter, or centre of mass, which is above Pluto's surface. As of 19 January 2015, New Horizons is nearly 5 billion kms from Earth and 200 million km from Pluto. On board cameras, which began long range imaging of the dwarf planet on 15 January, will be used to continually refine the trajectory of the spacecraft. On January 25, the first images of Pluto taken by the spacecraft’s telescopic Long-Range Reconnaissance Imager (LORRI) will be sent on the four and a half hour journey back to Earth, but these will only be mere dots. A key date for photos of Pluto will be in May when images will start to be “better than Hubble” quality. 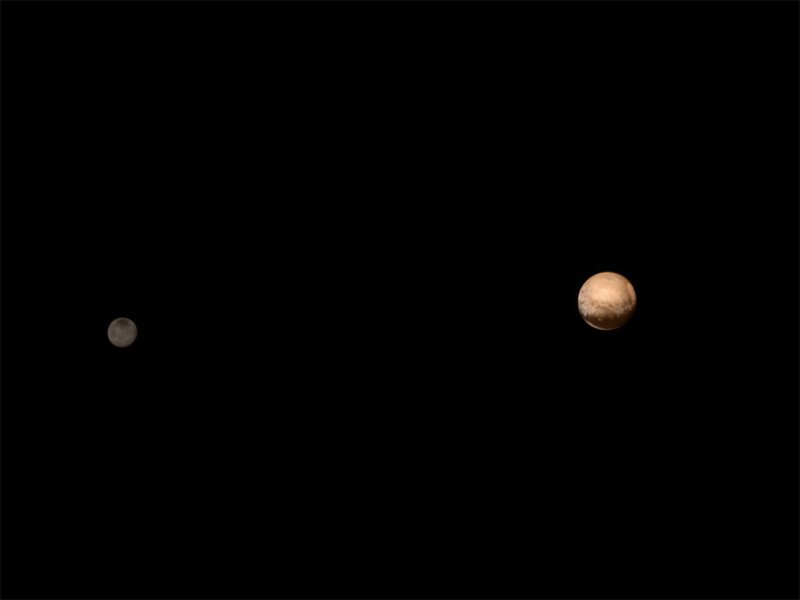 From this date till the flyby on July 14, we should receive images that will eventually reveal Pluto in great detail. 1997. His family kindly donated some of his ashes that are being carried in a small aluminium canister on New Horizons. These will remain on-board as the spacecraft flies past Pluto and on towards other Kuiper Belt objects. Fact 2: Considering the volume of data and the distance, it will take 16 months for all of the spacecraft’s Pluto data to be downloaded after the July 14 flyby! Let’s hope some early quick preview images are released. Fact 3: The 32-bit Mongoose V processor powers New Horizons’ systems. This is a 12 MHz hardened version of the processor that ran Tomb Raider on the PlayStation 20 years ago. There are actually 4 of these processors on board shared across 2 duplicate computers for redundancy, with each computer dedicating one processor for handling data, and one processor for guidance and control. Fact 4: New Horizons is the fastest ever man-made object and will whiz past Pluto at 14 km/s without slowing down. It would actually take more than 50 times its weight in fuel to slow it down enough to enter Pluto’s orbit. Fact 5: New Horizons weighed about half a ton when it was launched. Its primary structure is 0.7 m tall, 2.1 m long and 2.7 m wide. 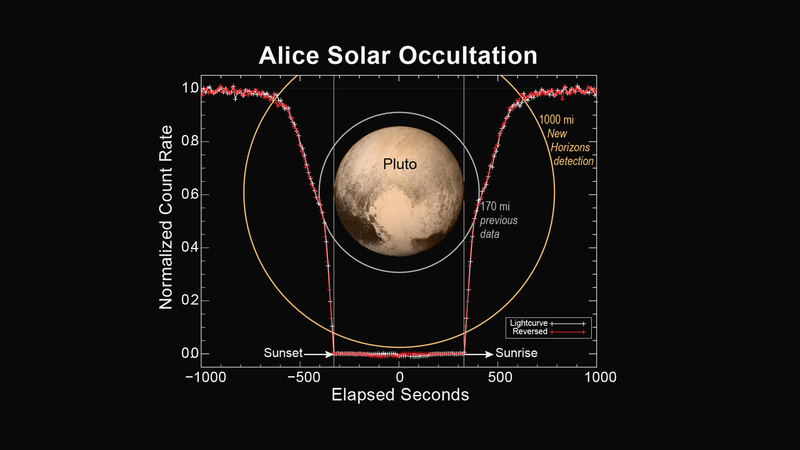 A radioisotope thermoelectric generator (RTG) powers it, with a maximum power of 240 W.
Fact 6: Pluto orbits the Sun every 248 years with an elliptical orbit. Its average distance from the Sun is about 6 billion kms. Fact 7: Due to its vast distance and relatively weak radio signal, New Horizons transmits its data back to Earth at a maximum of only 1 kbit per second (125 bytes/sec). This equates to about 10 full resolution LORRI images per day. Click here to see why communicating with Pluto is slow and hard. TBD : 2016 – 2022 - Kuiper Belt Object(s) fly-bys.